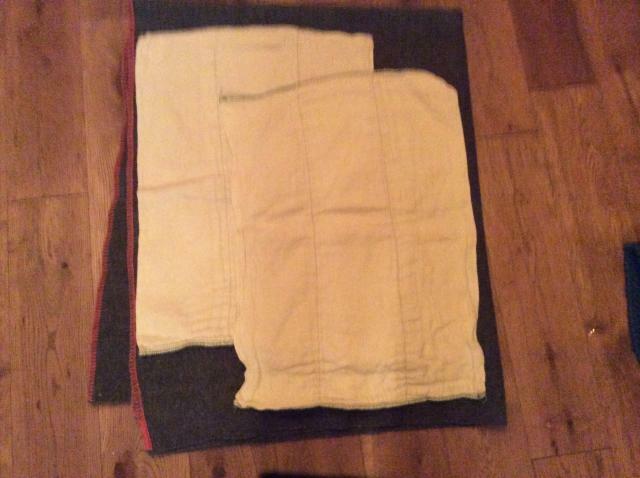 5 Cotton Bottoms large nappy, good condition. Suitable for babies 30+ lbs, 14+ Kgs. I have 23 in this size, I can sell any amount, let me know what you need and I can give you a quote. I am also selling other nappies and wraps, mostly Cotton Bottoms in this and other sizes. Second class mail. From a pet and smoke free household. Last edited by MEC on Mon Mar 27, 2017 8:32 pm, edited 3 times in total. Do you have 6 in the size 3 15-32lb - not sure what colour the edging is. I've got 51 of the small/medium nappies, they are actually the same size, the medium ones have blue stitching, the small new have white stitching, but they are identical apart from that. The wraps were different sizes. The medium ones are for size 15-30lbs. I can send you 6 of these for £6.85 including Paypal fees and postage, second class. Let me know if you want blue or white edge stitching or any mix! I would like 6 of the medium (blue edging) please. Once the small ones are pre-washed and tumbled they will shrink down a bit and my little one is already 15lb. If you pm me your e-mail address I will send the money over asap. I would like to buy medium nappies with blue stitching 15-30 lbs. Please let me know how many of them you have left and what would be the price. I am interested in buying at least 10 of them. Last bumped by MEC on Fri Jan 04, 2019 9:47 pm.